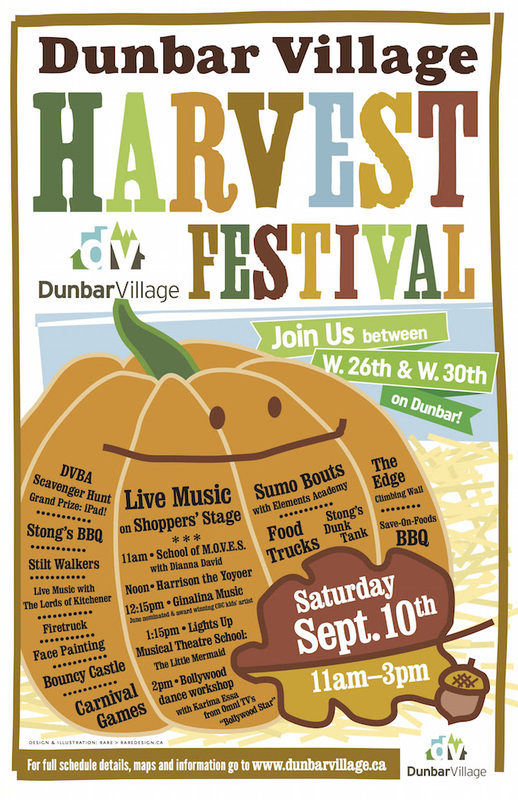 The Dunbar Village Harvest Festival returns to Dunbar St, between W 26th & W 30th, this Saturday. Hosted by Dunbar Village Business Association, this year’s festivities bring locals a variety of activities for adults and kids, group presentations, live music and entertainment and a scavenger hunt with the chance to win an iPad! Performers headlining the Shoppers Drug Mart stage include family-friendly acts such as Harrison the Yoyoer, School of M.O.V.E.S with Dianna David, Lights Up Musical Theatre School performing The Little Mermaid and Juno nominated and award winning CBC kids’ artist Ginalina Music. The festival is also offering activities for both adults and kids such as Sumo Bouts with Elements Academy, a climbing wall by The Edge Climbing Centre and a dunk tank hosted by Stong’s Market. Guests have the opportunity to take part in a scavenger hunt and win an iPad by completing store trivia in three separate areas of the Dunbar Village Harvest Festival. Food trucks will be on site at the festival and Stong’s Market and Save-on-Foods will be manning two separate barbecues to feed patrons. Donations from the Stong’s BBQ are going towards the BC Cancer Foundation and Save-on-Foods is donating its proceeds to BC Children’s Hospital. Shoppers Drug Mart will also be hosting a sidewalk sale benefiting the BC Women’s Hospital and Health Centre Foundation. For more information about the Dunbar Village Harvest Festival, follow Dunbar Village on Facebook and Twitter.